Friends and followers who only knew of TahJah Harmony as a photographer asked her where she got the image. What account did she screenshot? Her Instagram post in question was a photo of the popular mantra “Do something today your future self will thank you for!” The Baton Rouge artist had elegantly scripted those words herself, but most likers assumed it was taken from a famous account. Until that moment, Harmony had never thought of her hand lettering as something that would garner attention or lead to another artistic career. She’d been working as a freelance photographer for several years. And her calligraphy felt different than the traditional, she thought, as if it didn’t fit a predestined mold for success. Harmony had begun learning the art of aesthetic writing from her mother at the kitchen table as a small child, and it just felt more personal. Her shapes weren’t so uniform, not so rigidly similar to the letter that came before. Harmony still devotes half of her business to family, maternity and bridal portraits, but last fall she hosted her first calligraphy workshop. She loves teaching and wants to inspire creatives who keep 9-to-5s but pursue their passions in their spare time. Putting pen to paper is a great way to start. 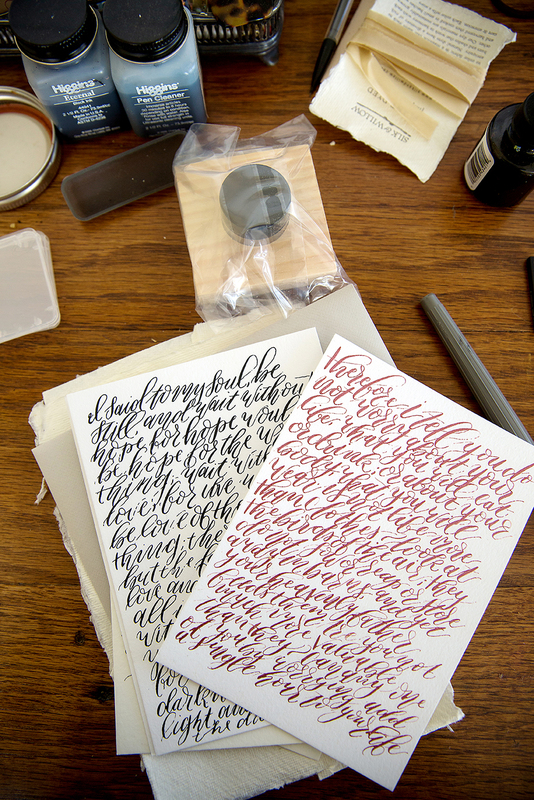 Though the Baton Rouge native doesn’t advertise it except through the occasional Instagram post, her pen-and-ink, pointed-nib-and-brush calligraphy—which she first learned the traditional Japanese way at Sunday school in a local Asian church—is gaining attention because she is preserving a lost art in a fresh way, one guided by the whimsical, dancing baselines that define her work and the offbeat influences like fabrics, handmade goods and, yes, dance, that inspire her to create.